Faculty, students and staff listen to keynote speaker Tracy Steele during the 2019 Dr. Martin Luther King Jr. Celebration. 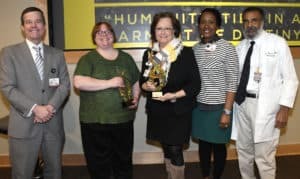 Jan. 25, 2019 | Dozens of UAMS employees gathered for the 2019 Dr. Martin Luther King Jr. Day Celebration, sponsored by the Center for Diversity Affairs, which celebrated the legacy of service advocated by the slain civil rights icon and included the presentation of the Unity Award for completing a collaborative service project. 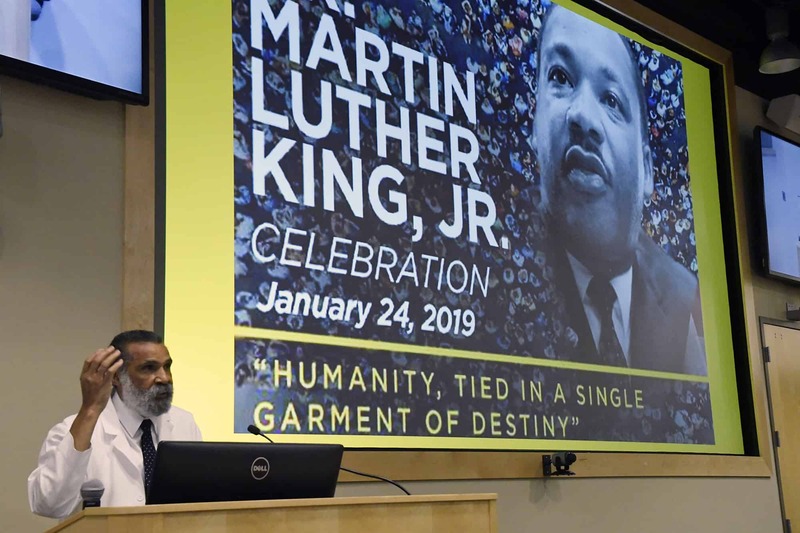 Billy Thomas, M.D., M.P.H., vice chancellor for diversity, said the center hosts the event not just to celebrate King, but to remind the campus and the broader community that his work is still ongoing. 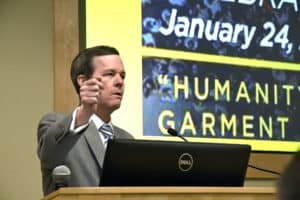 “In these types of celebrations, we think about all of the things that Dr. King stood for and all the things that he did. But I think we should take this opportunity to build upon his legacy and leave this celebration with the idea that we can do things, not only individually but as an institution, to accomplish that,” he said. 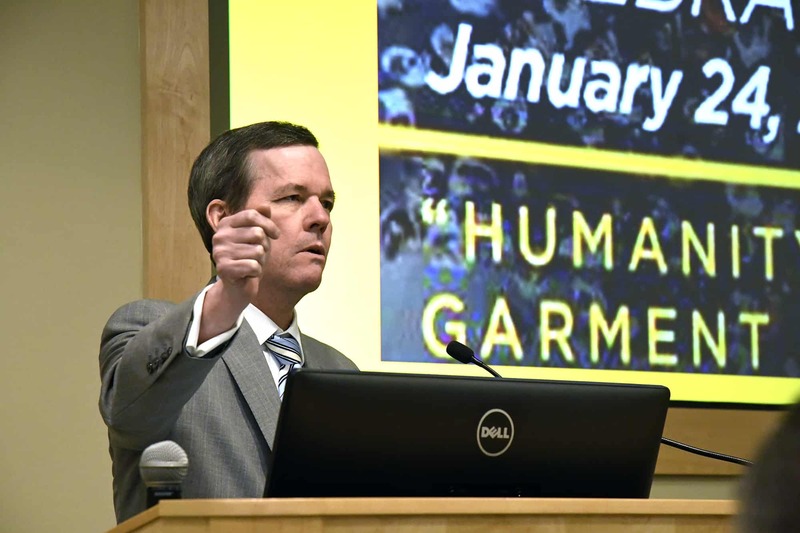 The event included remarks from UAMS Chancellor Cam Patterson, M.D., MBA, as well as a keynote address from Tracey Steele, the first executive director of the Arkansas Martin Luther King Jr. Commission and a former state senator who is now the director of the Health Services Permit Agency. 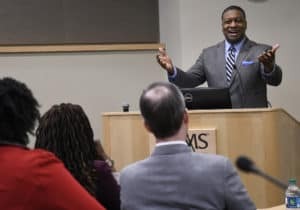 Steele praised UAMS as a leader in diversity, and challenged staff and students to continue to lead the way. 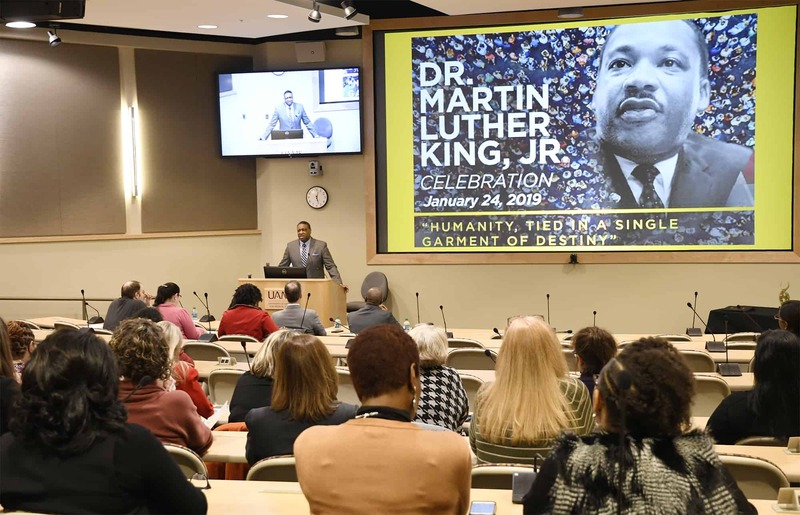 In his remarks, Chancellor Patterson said he’s influenced by King in three ways: his urging to do the right thing and avoid doing wrong, the importance of doing the right thing even when facing adversity, and remembering that there is always a vision of a better world, even if it does not exist yet today. 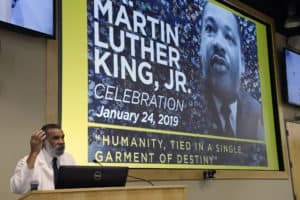 Patterson also shared his own favorite quote from King – “of all forms of discrimination and inequality, injustice in health care is the most shocking and inhumane” – and used it as a call to action for the campus. UAMS Translational Research Institute and Central Arkansas Veterans Healthcare System – Health and Wellness Committee: Collected and distributed items needed by the Promise Garden at 12th and Peyton streets in Little Rock. Collection included seeds and tools, as well as cash for chicken feed with the hope of offering sustainable assistance. College of Medicine – Office of Admissions and UAMS student chapter of the League of United Latin American Citizens: Leading up to Christmas, collected and distributed toys in a drive benefitting community service organization Integrity, Inc. and Bethany Christian Services. Department of Lab Animal Medicine and Division of Endocrinology – Research: Organized a collection drive of bedding, linens, toiletries and other products and donated them to the Compassion Center, a shelter for homeless, transient, and displaced people in the Little Rock metro area. Campus Operations – Operational Support Services and Institutional Compliance: Organized a collection for a variety of items, from toiletries to blankets to tents, and provided them to the Van, a nonprofit that reaches out and brings such essentials to homeless camps directly. Office of Sponsored Programs Administrative Network, Office of Research and Sponsored Programs, Science Communication Group and Grants Management Program Alumni: Organized two fundraisers to supply Christmas gifts to students in three Head Start classrooms and arranged a collection to buy gifts for young people in the care of Immerse Arkansas, which serves youth in crisis not served by the state foster care system. From left: Chancellor Cam Patterson with Unity Award winning team representatives Nia Indelicato, Pam Christie and Monica Smith, and Billy Thomas of the Center for Diversity Affairs. The Unity Award was presented to the team consisting of Translational Research Institute personnel and the Central Arkansas Veterans Healthcare System.